In the first of all the Sherlock Holmes stories, Dr. John Watson, discharged from military service after suffering severe wounds, is at a loose end until a chance encounter leads him to take rooms with a remarkable young man. The arrogant, irascible Sherlock Holmes is a master chemist, a talented musician, and an expert on all aspects of crime. And when Watson is drawn into the investigation of a bizarre murder in which Holmes is involved, he is unaware that it is the beginning of the most famous partnership in the history of criminal detection. The mystery begins when a body turns up in an abandoned building. A baffled Scotland Yard calls in the world's first "consulting detective," Mr. Sherlock Holmes. Through observation, subterfuge, and tenacity, he is soon able to discover the identity of the assassin, but that is only the beginning of the bizarre mystery. 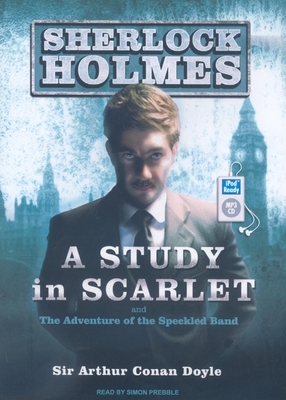 This audiobook includes the bonus Sherlock Holmes story "The Adventure of the Speckled Band. Sir Arthur Conan Doyle (1859-1930), a Scottish writer whose works include science fiction stories, historical novels, plays, romances, poetry, and nonfiction, is best known as the creator of the detective Sherlock Holmes.